This super simple salad is a total crowd pleaser. It came about as a way to use up leftover crudités after a holiday celebration. I love holiday leftovers for about a day… then I’m craving new flavors, usually Asian flavors . So I created this salad to satisfy that craving but still have something fresh and light. The salad is defined by the dressing. The dressing is uber savory (with gluten-free tamari and miso), tangy (with lots of lime), has a little kick (with garlic and de-seeded jalapeño)…. and it is SO GOOD! 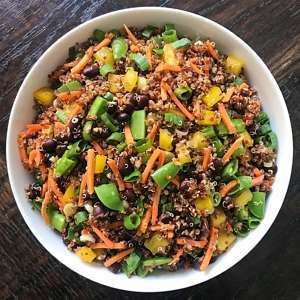 And the beauty of this salad is that you can really use any leftover crudités you have, mix in quinoa, black beans if you want additional protein, toss with the dressing and voila! 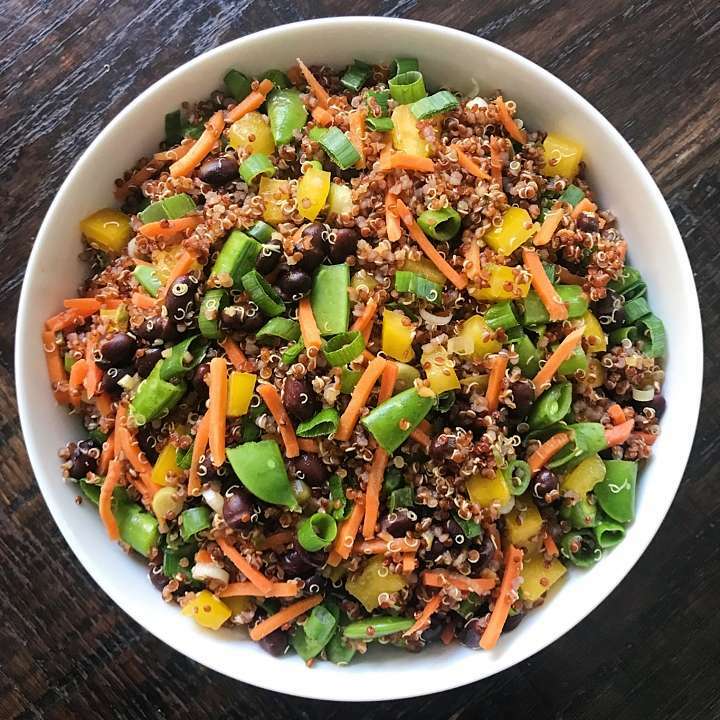 Here is I used snap peas, yellow bell pepper, carrots and black beans tossed with quinoa, scallions and the Sesame Lime Miso Dressing. This light, fresh salad is defined by its uber savory and tangy dressing, and it's a total crowdpleaser. Feel free to substitute whatever veggies you have on hand and it will still taste great! In a large bowl add cooked quinoa, veggies, beans and ½ the dressing. Toss to combine. Add more dressing as desired. Serve cold or room temperature. Stores well in the refrigerator for several days in a sealed container.